Years ago, before commercial paints were sold everywhere, people mixed their own paint out of milk and a few other ingredients found at most homes. 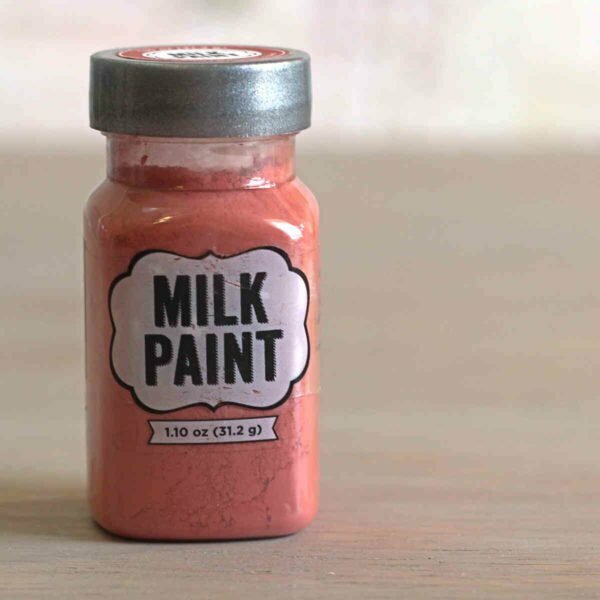 Learn how to make milk paint yourself, with two different methods. These paints didn’t have any chemicals (VOCs) to off-gas, so they were much safer to be around than even most modern “green” paints. The cool thing about milk paint is its translucency. It yields a sort of mottled, streaky, matte finish that looks antique or old-fashioned. It’s a beautiful finish, not unlike chalk paint, and you can use it on walls or furniture. But if you prefer a smoother finish, a second coat will give it to you. That makes this a very flexible type of paint to use. It’s most often used to restore old furniture. Because it can look distressed, that makes it a great choice for painting antique chairs, desks and other furniture. Before I get into exactly how to make it yourself, I’ll let you know that you can also buy ready-made milk paint from Amazon and other online retailers. That definitely makes things simpler, if you prefer. I’m also going to tell you how to make it from scratch (scroll down). 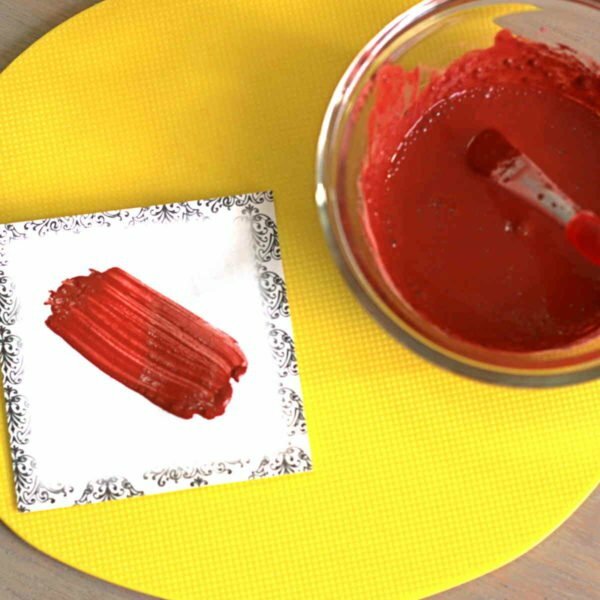 But first, this is the easy method, using powdered milk paints you can buy in stores. I used American Crafts brand, which already has the milk proteins in it. You just have to mix it with water. 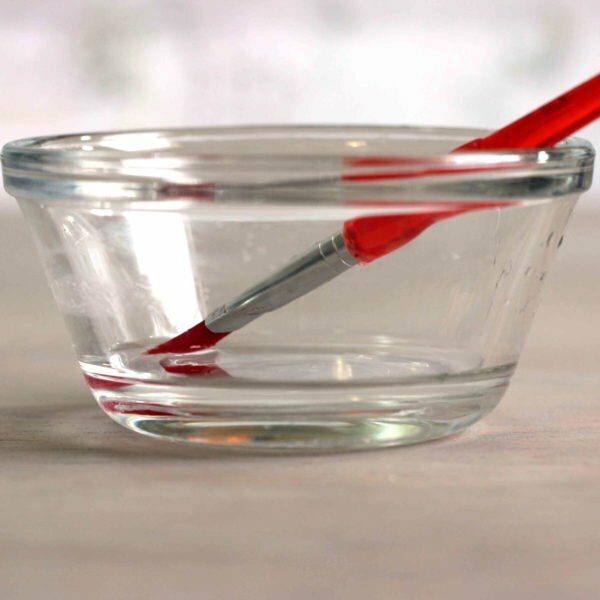 You mix it with a 1-1 ratio – the same amount of pigment as water. Here, I’ve used just a small amount of water. Now I’ll dump in the same amount of pigment. It’s not the easiest thing to stir, and you have to keep at it a while, using some elbow grease. I found it worked best with a whisk, but then you need to let it sit for a couple of minutes so the bubbles go away. Here it is, about half-stirred. Here it is after I’ve mixed it up thoroughly and painted a swatch onto paper. The streaky finish would be more obvious on a surface like wood. And here’s the swatch, closer up. This method is more work, but also more flexible. Instead of being limited to whatever colors are available in ready-to-mix milk paint pigments, you can use any dry pigment out there. 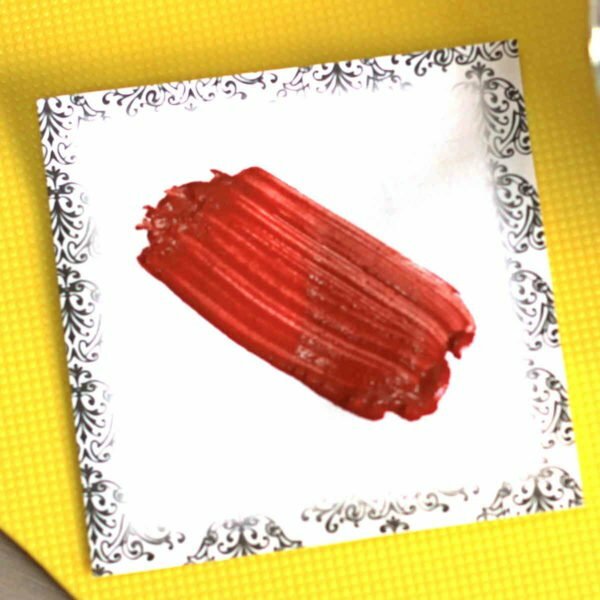 Plus, it’s fun learning how to make types of paint from scratch (if you enjoy this tutorial, check out my tutorial on tempera paint). 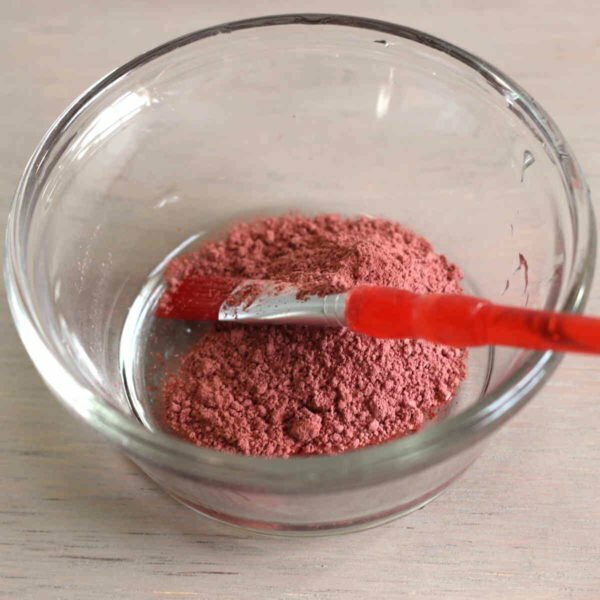 You can buy pigment powder at art stores, or online, as I linked to above. They’re just a colorful powder that you can mix into any sort of medium. Let the milk sit out until it reaches room temperature. Stir in the vinegar or lemon juice – curdling will begin immediately. Leave the mixture to sit at room temperature overnight or up to two days. Line a sieve with cheesecloth and pour the mixture through it to remove the curds (solid chunks) from the whey (liquid part). 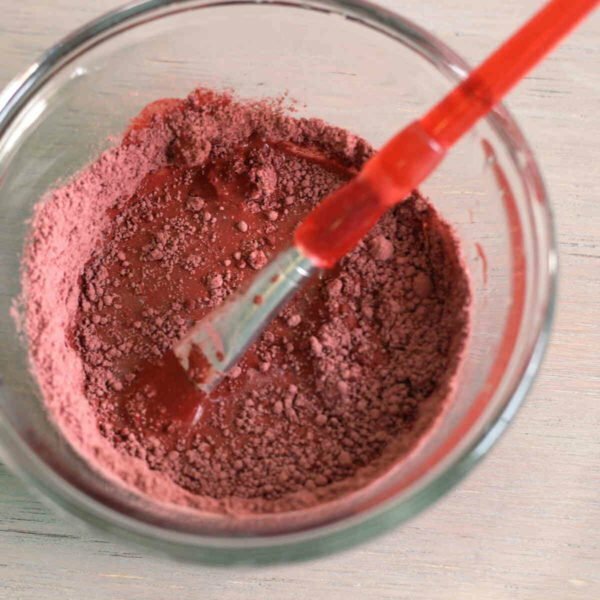 Add in the dry pigment powder slowly, stirring until the color is evenly dispersed (it’s a good idea to wear a mask during this part, just because the powder is so fine you could easily inhale some). Only mix as much as you can use within a few hours of mixing. This paint will thicken and become unusable after that. 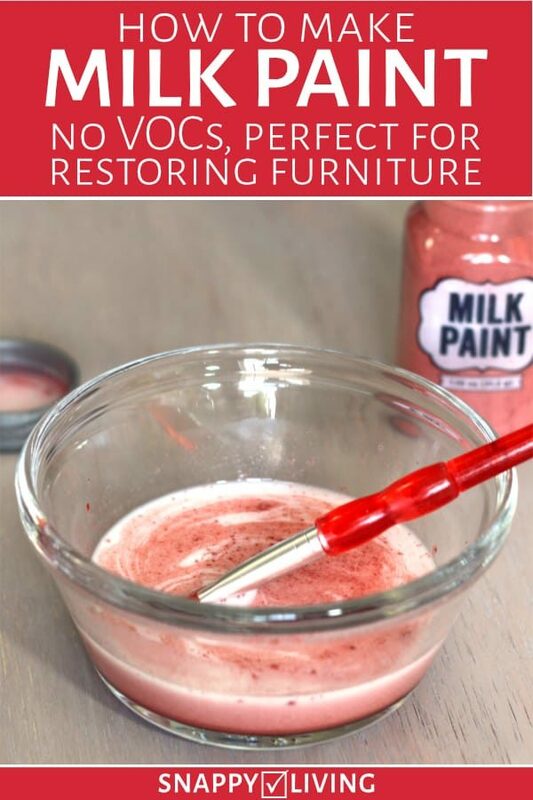 This recipe yields enough paint to cover a large piece of furniture. Double it (or more) for larger projects, such as the walls of a room. Milk paint has a sour smell while you’re applying it, but it disappears once it’s dry. You can comfortably be in a room that was painted just a few hours ago and not be bothered by the smell. If the first coat isn’t as opaque as you’d like, add more coats. Milk paint will never look as opaque as commercial paints, but you can get a bold finish and strong color with multiple coats. To make the finish shinier on wood furniture, add a coat of tung oil. It sinks into the wood and nourishes it, which helps preserve the finish longer. This. is. awesome. I love the concept of milk paint, but I have never used it before. I can’t wait to try this out! Thanks! I was also wondering, do you know if you could use plants to dye the milk mixture? Milk has gone up a lot since I wrote this post, so you’re right – it’s only cheaper if you’re doing a small area. You could definitely use plants to dye it, but there’s a slim chance they would alter the mix’s properties in a way that it wouldn’t work so well. I think that’s unlikely, but you might want to test a patch first, if possible. This was my first attempt at making milk paint. I didn’t have lime, which most recipes call for, so I was glad to find a recipe that didn’t require it. It turned out pretty thin and watery. Most milk paints that I’ve seen were opaque after the 2nd coat. This one was more of a glaze over the wood at 2 coats, It’s very nice looking, but not what I was wanting. It also started cracking off in places, like the crevices, that had more paint pooled up. I’m off to get some lime, and try it again!! Hoping to just add a bit to this mix, and see what happens. Hmm, this recipe is supposed to be translucent and leave a streaky look (paragraph 1). Is that not how it turned out? Hi! I am looking forward to trying this recipe!! With all the painting I do using something different will be awesome! Thank-You so much for the tips!! Where do get your pigment? Will this work for glass mason jars? At an art store, or even Amazon: https://snappyliving.com/go/dry-color-pigment/ It should work on Mason Jars. Kery, I have to politely disagree, unless of course you live in Hawaii, and then I apologize. I just went to the grocery store to buy milk and vinegar to make milk paint and it was SO much cheaper than commercial paint! I have previously purchased 1 qt of premixed commercial milk paint, it was $20.99. At my local kroger generic skim milk was $.98 a gallon and vinegar was $1.99 for a gallon bottle. Thanks for all that detail, Alison! I am in the process of making milk paint and naively thought since I wanted white I needn’t worry about the powdered pigment. My mom pointed out that the milk paint is basically just the binder and if I want white I have to add white pigment and of course it’s 9pm and all the art stores are closed and i just strained my curds and want to paint now! 1. Adding white acrylic paint to the milk paint. 2. White Chalk (calcium carbonate) ground into powder form. If so how would it change the visual effect of the paint when dried? Like would it still look like milk paint or defeat the purpose? I’ve never actually tried either of your solutions. Acrylic paint would add white, for sure, but it might change the texture and make it less streaky/antiquey. I think chalk would add enough pigment, but I’m not positive. It’s enough to mark up a chalkboard, so my guess is that it would work well.